Dietary supplement. 10 times more effective liver detox. The most effective product for liver detoxification. Revolutionary patented combination of Milk Thistle and phospholipids (10x stronger effect). 3 in1 action: detoxes, regenerates and strengthens your liver. Suitable for vegetarians (contains cellulose capsules). Contains HEPAforte complex™ with five key ingredients to support your liver: milk thistle (Silybin extract) binds and flushes toxins excreted by the liver, phospholipids (from soy lecithin) act like microscopic oil caps, improving the bioavailability of the thistle extract by a factor of 10, artichoke facilitates the detox process, black pepper improves the bioavailability of the natural ingredients by 15% and vitamin E protects liver cells from the oxidative stress. 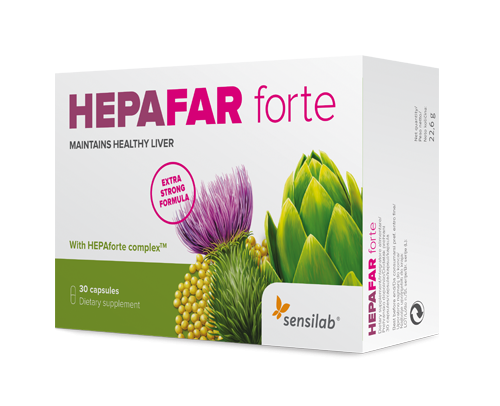 Due to its top formula of powerful ingredients, Hepafar forte packs a triple synergistic effect: detoxes, regenerates and strengthens your liver. Use: Recommended daily intake: 1 capsule in the morning and 1 capsule in the evening with a glass of water after a meal. Active ingredients in 2 capsules: HEPAforte complex™ (artichoke extract, silybin-phosphatidylcholine complex, vitamin E and black pepper) 918 mg (vitamin E 48 mg – 400% NRV).